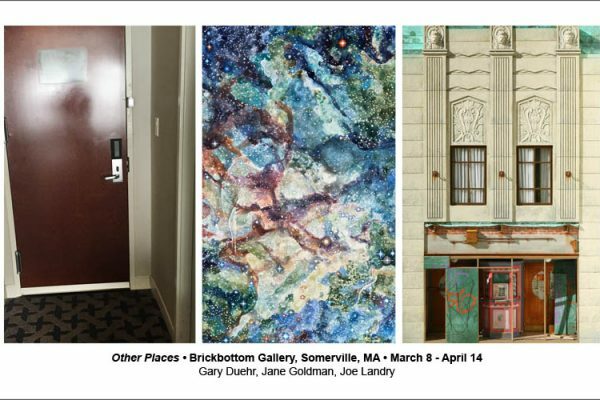 Three Boston artists explore different spaces and how people understand them. Using a range of different media, processes and perspective, the artwork in OTHER PLACES looks at the human environment in fresh ways. Jane Goldman will show large paintings from her series Parsing the Universe in which she ponders the cosmos and what technology allows us to see, as well as our place in the big scheme of things. of banks and luxury hotel lobbies that examine edifices of power. Joe Landry will display his hyperrealist sculptures — wall-hanging architectural reliefs that represent recollections of personal places. His artworks are the most grounded in individual experience.